The Gospel of Mark is a fascinating book! It was written to a group of suffering Christians who were facing execution, and had no time for theological intricacies, Mark cuts to the chase and provides them with a jargon?free summary of the gospel story. Who is Jesus, and why is He worth dying for? Mark even does away with any reference to Jesus? birth, so he can focus on the most essential stories that convey the meaning and power of Jesus? life, death and resurrection. With one third of the gospel is devoted to the week of Jesus? death, Mark's message is clear ? the all?conquering Son of God is also God's ?suffering servant?. The true meaning of His life revolves around a cross, three hours of darkness and an empty tomb. In forty?five days, you'll be guided through the wonderful good news by well?loved Bible teacher, Jeremy McQuoid. There are comments for each day's portion and Jeremy finishes off each reading with some questions for private reflection. 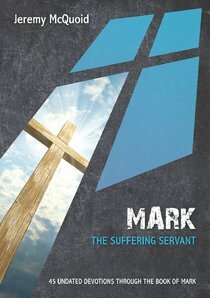 About "Mark - the Suffering Servant (10 Publishing Devotions Series)"
Jeremy is the Teaching Pastor at Deeside Christian Fellowship Church in the UK, a growing independent evangelical congregation in the suburbs of Aberdeen. He earned his Master of Divinity degree at Trinity Evangelical Divinity School in Illinois. The book of Acts is one of the most exciting parts of the whole Bible. Jesus has ascended to heaven, the Spirit has come to the church and we see God at work. The Spirit empowers God's people to fulfil the command of Jesus to preach the gospel to the ends of the earth, and in this fast paced section of the Bible we see the growth of the church. What is God wanting us to learn from this book, and how does it apply today? David Cook, a well loved Bible teacher, walks us through the book of Acts in fifty undated devotions and shows us the power of the Spirit at work in God's people to build His church. Each day has a short reading, a devotion to read through, and then a thought, prayer, or question to help us meditate on God's Word.